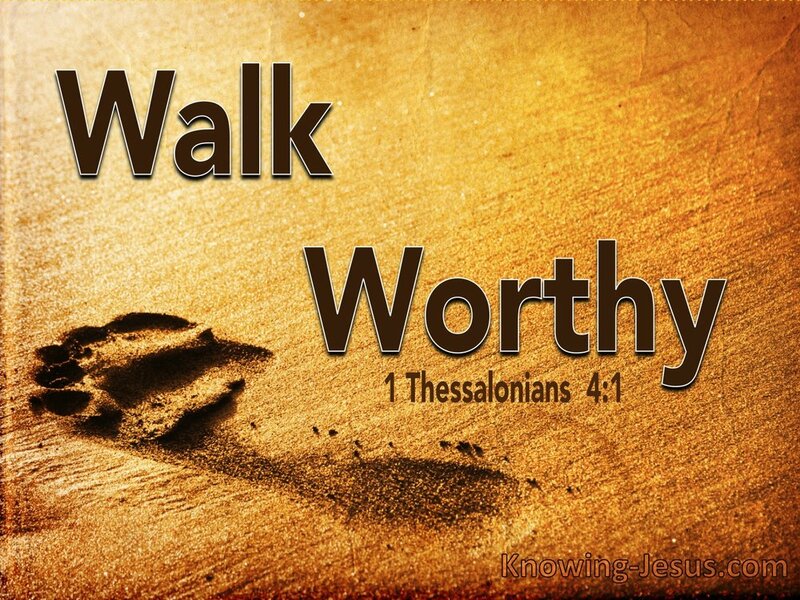 1 Thessalonians 4:1-12 Finally, brothers, we urge and exhort you by the Lord Jesus, that as you have learned from us how you ought to walk and to please God, you should excel more and more. 2 For you know what commands we gave you through the Lord Jesus. 3 For this is the will of God, your sanctification: that you should abstain from sexual immorality, 4 that each one of you should know how to possess his own vessel in sanctification and honor, 5 not in the lust of depravity, even as the Gentiles who do not know God, 6 and that no man take advantage of and defraud his brother in any matter, because the Lord is the avenger in all these things, as we also have forewarned you and testified. 7 For God has not called us to uncleanness, but to holiness. 8 Therefore he that despises does not despise man, but God, who has also given us His Holy Spirit. 9 As concerning brotherly love, you do not need me to write to you. For you yourselves are taught by God to love one another. 10 And indeed, you do have love for all the brothers who are in all Macedonia. But we urge you, brothers, that you increase more and more. 11 Learn to be calm, and to conduct your own business, and to work with your own hands, as we commanded you, 12 so that you may walk honestly toward those who are outsiders and that you may lack nothing. Living to please God is more important than anything we do in this life. Why? This life is short and temporary along with everything that is in it. When we have purpose in our hearts to put God first, we will then begin to see ALL areas of our life fall into place. I am not saying no struggles, but what I am saying is God’s best will be the result for us even after testing and trials. God will see to it! Acknowledge God in ALL our ways, live our lives to please Him by daily washing our hearts and minds with the word of God through obedience to it by the leading of the Holy Spirit and we will be found to be pleasing in God’s sight..
Only what we do for Christ will last!! God alone is eternal! Lord, I want to be more like you! Make me a vessel you can use! Remember, pleasing God must be at the forefront of our daily agenda. Proverbs 15:3 The eyes of the Lord are in every place,keeping watch on the evil and the good. In this world in which we live where chaos, violence, crime, murder, betrayal, deceitfulness, craftiness, dishonesty, wars, rumors of wars, lovers of self, hatred, envy, jealousy, danger, fears, missing and exploited children, high divorce rates, little reverence for God, disrespect, etc., are the thing that our eyes see daily that could, would and do cause many to easily ask “where is God” and does He sees and knows about all the chaos in the world today. Believe it or not but the Lord is aware of ALL the affairs of the universe. NOTHING catches God by surprise! The Lord God is “OMNIPRESENCE”! There is no where that He is not! We are reminded in this text that the eyes of the Lord is “keeping watch” on the evil and the good. What does that say to you and I? It reminds us that God is in control of everything regardless of how the world may look to us. We are not God and are not able to see what He sees nor do what He does. Why God allows what He allows? He alone knows the reason why He does allow good and evil, but the good news is that both deeds will be judged and rewarded by Christ. Yes, every knee will bow and every man, woman boy and girl will be rewarded according to the life they lived. Where can we run from God’s presence and sight of our God who sees and knows all things? NO WHERE! King David puts it this way in Psalm 129:7-12 Where can I go from your Spirit? Where can I flee from your presence? 8 If I go up to the heavens, you are there; if I make my bed in the depths, you are there. 9 If I rise on the wings of the dawn, if I settle on the far side of the sea, 10 even there your hand will guide me your right hand will hold me fast. 11 If I say, “Surely the darkness will hide me and the light become night around me, 12 even the darkness will not be dark to you; the night will shine like the day, for darkness is as light to you. The fool is not God, it’s self! God sees and knows ALL things. God sees every tears that falls from the eyes of His children, He sees our good works and He hears every one of his children’s prayers. Nothing falls from the ears of God where His people are concerned. Whatever your lot may be on today God’s people, NEVER doubt His awareness of them nor His presence with you in them. When the tides of life seems to rise above our understanding, this is the place where our faith, hope and trust in God has to also rise above in knowing that the Lord our God is the Sovereign God of the universe, He sees and knows ALL things and He is right there with us. 2 Chronicles 16:9a The eyes of the LORD search the whole earth in order to strengthen those whose hearts are fully committed to him. People of God, the word of God declares that a day of reckoning WILL COME when we ALL will give an answer to how we lived in these bodies, be it good or evil. Romans 14:12 Yes, each of us will give a personal account to God. People of God, grab a hold of, seal it on the wall of your heart and mind and believe what God says about NOTHING being hidden from Him, including darkness and what’s done in the dark. Psalm 139:12 even the darkness is not dark to you; the night is bright as the day, for darkness is as light with you. Our God is the God who sees and knows ALL things, therefore regardless of all the negativity around us and all of the opportunities to fear and worry, the Lord God is our hope on today. The word of God declares that those who hope in God will not be ashamed. If God sees and knows all things, we as the people of God we can rest assured right here! Job 26:7-14 He stretches out the north over empty space, He hangs the earth upon nothing. 8 He binds up the waters in His thick clouds, and the cloud is not broken under them. 9 He covers the face of the full moon and spreads His cloud over it. 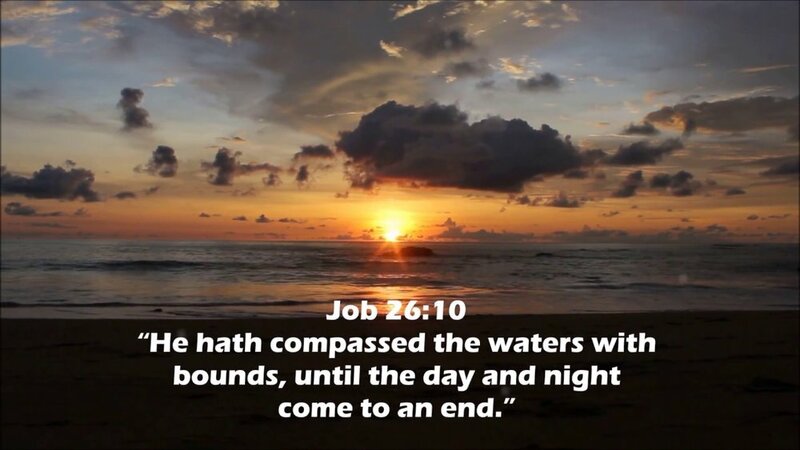 10 He has circled the waters with boundaries, until the day and night come to an end. 11 The pillars of heaven tremble and are astonished at His reproof. 12 He divides the sea with His power, and by His understanding He strikes through the proud. 13 By His breath He has made fair the heavens; His hand has formed the fleeing serpent. Amazing is our God! There is NONE like Him! The Lord our God took nothing and made everything! I am glad to declare this day and everyday that You are my God Lord! Worthy are you Lord! People of God, open wide your mouth and exalt your “KING JESUS” Who is Lord of Lord. No one compares to you Lord! AMAZING IS OUR GOD! Indeed You are a keeper and sustainer of your people Lord. Thank You Lord for You alone is God of the universe. PSALM 63:1-8 O God, You are my God; early will I seek You; my soul thirsts for You, my flesh faints for You, in a dry and thirsty land with no water. 2 I have seen You in the sanctuary, to see Your power and Your glory. 3 Because Your loving kindness is better than life, my lips will praise You. 4 Thus will I bless You while I live; I will lift up my hands in Your name. 5 My soul will be satisfied as with marrow and fatness, and my mouth will praise You with joyful lips. 7 because You have been my help, therefore in the shadow of Your wings I will rejoice. 8 My soul clings hard to You; Your right hand upholds me. Are you thirsty for God? He alone can quench your thirst so seek Him on today with your whole heart. Draw nigh unto Him and He will draw nigh unto you. Psalm 61:1-8 Hear my cry, O God, attend to my prayer. 2 From the end of the earth I will cry to You; when my heart faints, lead me to the rock that is higher than I. 3 For You have been a refuge for me, and a strong tower from the enemy. 4 I will abide in Your tent forever;I will seek refuge in the covering of Your wings. 5 For You, O God, have heard my vows; You have given me the heritage of those who fear Your name. 6 May You prolong the king’s life, and may his years be as many generations. 7 May he sit enthroned before God forever; oh, prepare mercy and truth, which may preserve him. 8 Thus will I sing praise to Your name forever, that I may fulfill my vows day by day. The Psalmist knows that the Lord our God is an assurance in any and ALL circumstances of life, therefore he cries out to Him in prayer. 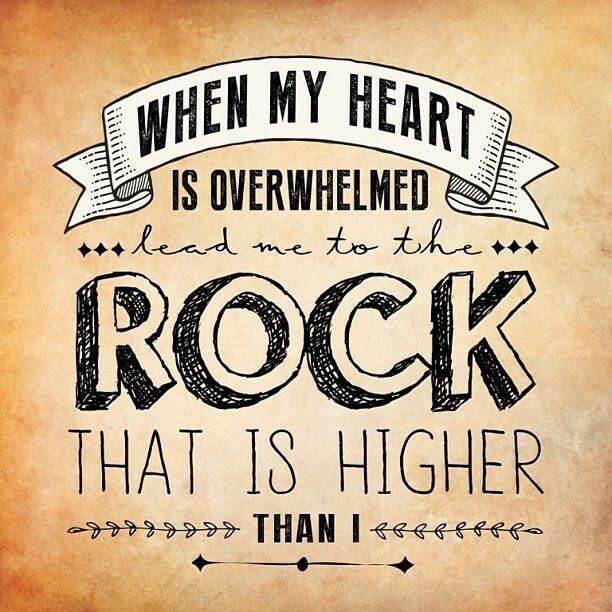 The promise of God to His people is a “ROCK” higher than us that we can run to in prayer when our heart is overwhelmed.